A few days before Christmas, David’s uncle invited the whole family for a pre-Christmas dinner. The thing is that he’s not a fan of Christmas food. At all. 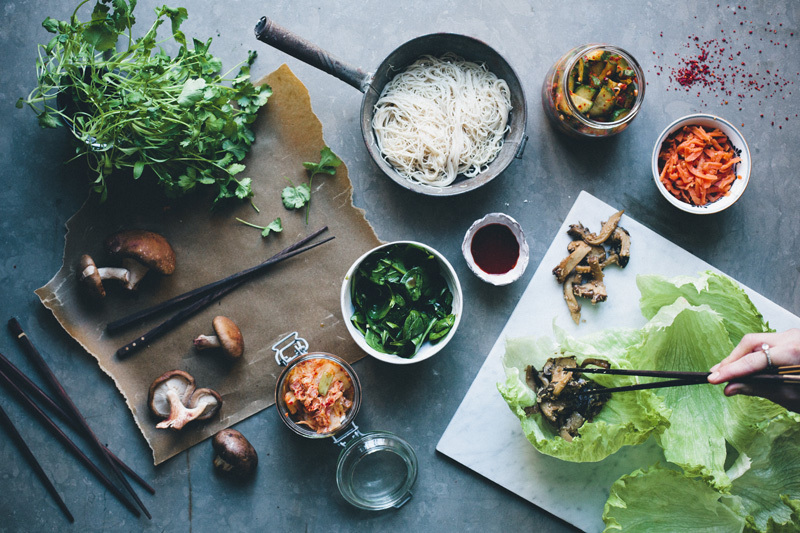 So instead of traditional food he prepared a homemade Korean BBQ – with a full table of fermented and pickled vegetables, rice noodles, sauces, fresh bell pepper, seared salmon and meat ready to be thrown on the small table grills. Everyone picked a little bit of this and a little bit of that onto their plate, and wrapped it up in thin lettuce leaves. It was without a doubt one of the most delicious and unusual Christmas dinner that we have experienced. Since you just as well can make this dinner on a non-Christmas occasion, we decided to recreate a few of the recipes for you. We obviously don’t eat meat but wanted to add something more substantial and chewy to the wraps. So we seared mushrooms in shredded coconut, ginger and soy sauce. They turned out so very delicious, also on their own. Korean wraps is a really fun thing to do for dinner. The flavors are kind of similar to a bibimbap, but much lighter. And you can fill them with a little bit of everything. Here we have added a marinated spinach salad, pickled spicy cucumber, fermented carrots, brown rice noodles and topped them with some gochujang sauce and fresh coriander. And not to forget, our homemade fermented Kimchi. If you for some reason haven’t heard of Kimchi before, we recommend that you immediately add it to the list of things you need to try. It is a fermented spicy korean cabbage salad with a very intriguing and wonderful flavor – a kind of pleasantly sour and pungent taste. It is probably the most famous ingredient in the Korean kitchen. It is also one of David’s favorite things to eat – all categories. Apart from its flavor, it also has several health benefits. 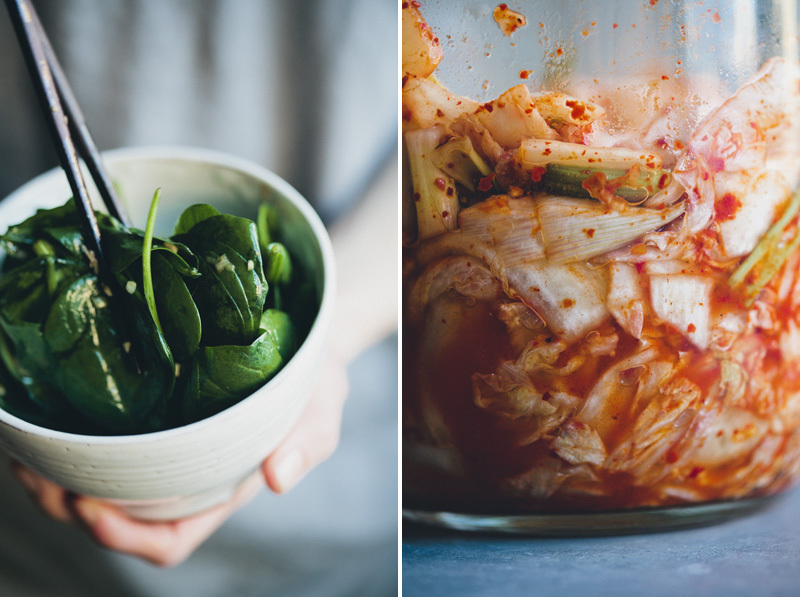 We have been wanting to share a kimchi recipe with you for a long time. And decided to do it now as part of the Fabulous Fermentation Week. It’s an initiative started by two food blogging friends of ours, Sarah from My New Roots and Elenore from Earthsprout. 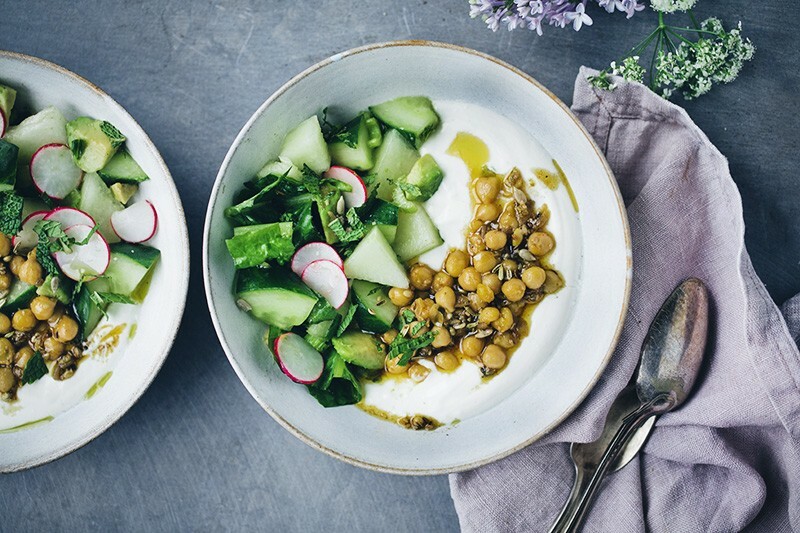 The Fabulous Fermentation Week starts today and the idea is to put spotlight on and celebrate fermented food and all the health benefits that comes from it. Sarah and Eleonore are compiling a list of all other bloggers that shares a recipe during this week. And are also explaining the health benefits a bit more. So head over there to check it out. It is not the first time we play around with fermentation, we have also had food, bread and drink recipes here on the blog, and we have have a fermented Kombucha cocktail recipe in our upcoming book. 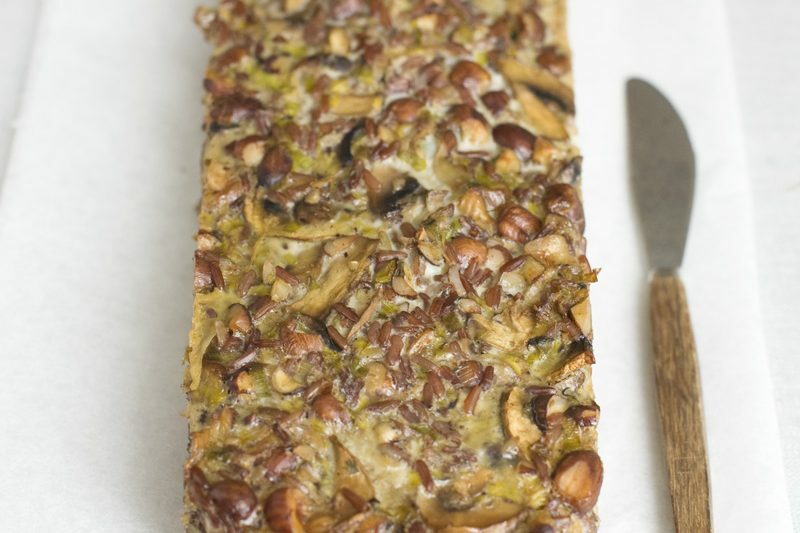 If you want to take your home fermentation to another level, this post is brilliant. 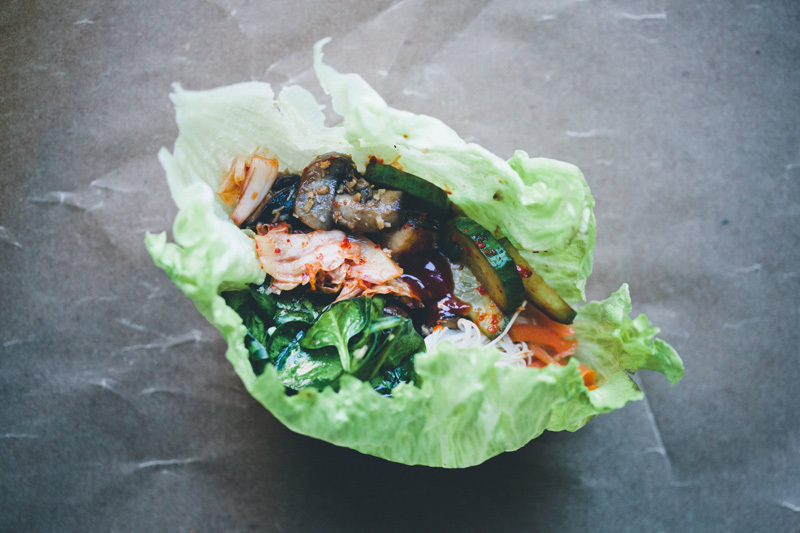 You can make these wraps tonight if you buy ready-made kimchi (available in most Asian stores) and leave out the pickled cucumber. 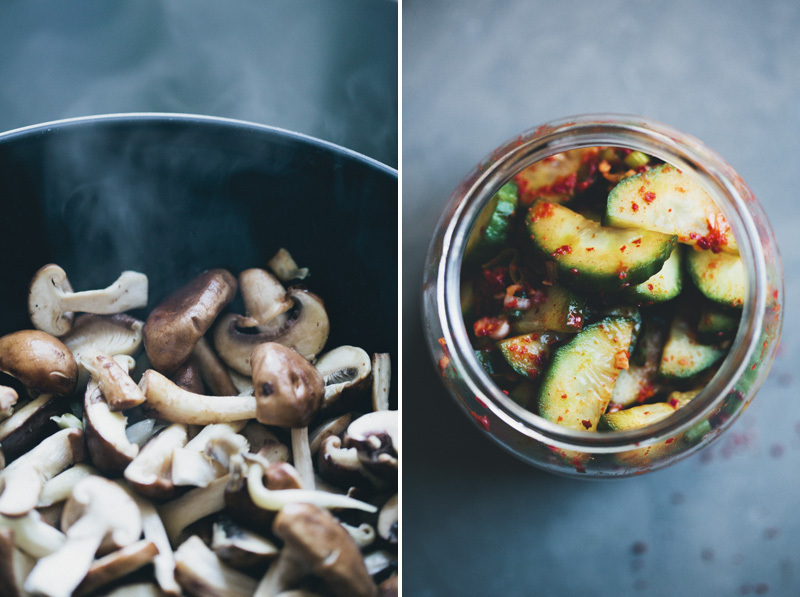 If you choose to make the kimchi yourself (which we really recommend! 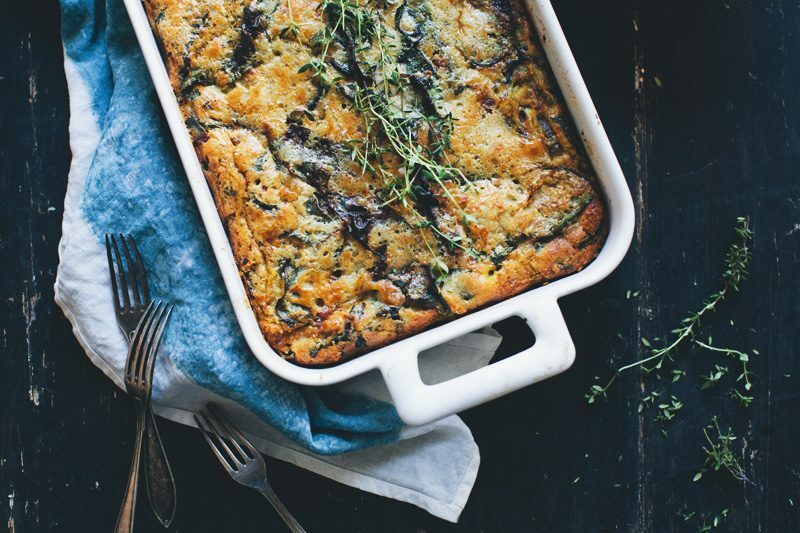 ), you need to make it at least 3-4 days before you plan to eat it – to give it time to ferment. So start with that. Prepare the cucumber salad 1 day in advance. All other ingredients can be prepared the same day. other fermented vegetables like carrots (in the picture), sauerkraut, fermented soy beans etc. Assembling: Lay a salad leaf on your plate. 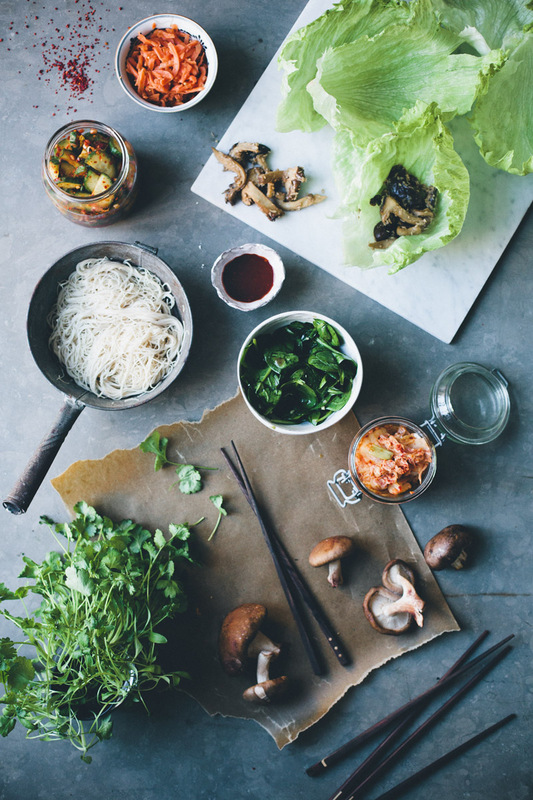 Fill it with noodles, mushrooms, cucumber kimchi, fermented kimchi, spinach, fermented carrots, a dollop gochujang sauce and some fresh coriander. Use your fingers to carefully tuck it into a wrap or parcel. Take a big bite! Prepare the cabbage by removing the outer leafs, slice lengthwise half, then again in quarters. Remove the core and cut into 2 inch / 5 cm pieces. Place cabbage in a large non-reactive bowl, sprinkle with salt and toss well to combine. Place a smaller plate on top and a heavy bowl or books to weigh down. Set a side for 24 hours. Rinse the cabbage well in cold water to remove the salt and squeeze out the excess water. Mix rice vinegar, chili, honey, ginger and spring onions in a large bowl. Then add the cabbage and toss well to combine, use your hands or a wooden spoon. When mixed, place in a glass jar or crock pot, close the lid and leave in room temperature for 2-3 days. Then place in the fridge for 4 days before you can eat it. If you don’t open the jar you can keep it in the fridge for weeks (probably months). Wash the cucumber and cut lengthwise in half, then thinly slice. Place in a small non-reactive bowl, sprinkle with salt and toss well to combine. Place a smaller plate on top to weigh down (no need to place something heavy on top). Set a side for at least an hour. Rinse the cucumber well in cold water to remove the salt. Now add onion, garlic, chili, honey and vinegar and toss well to combine, use your hands or a wooden spoon.When mixed, place in a glass jar, close the lid and place in the fridge for 1-2 days. Ready to eat. Rinse the baby spinach and place in medium mixing bowl. Add all ingredients and toss well so every spinach leaf is coated. Leave to marinate for 15 minutes before serving. Prepare the fresh mushrooms by simply wipe them off with a damp paper towel (do not wash them with water, as they will only absorb the liquid and get mushy when cooked). Slice the mushrooms in large bite-size pieces. In a large frying pan, heat oil or ghee, then add mushrooms. Add the mushrooms, toss a couple times to coat them in oil. Add ginger, coconut and soy sauce. Cook for a couple minutes, and shake pan and leave to fry gently for 5-7 minutes. When the mushrooms have browned nicely, add a knob of coconut oil or ghee and the lime juice, and toss again so everything is mixed. Ready for serving. I'm a new reader and I thank you for this. Fermented foods are high on my to do list now I can immediately do this. It's talking my husband into this but, he's a good sport in time I'll get him converted to healthy eating. Thanks a million!!!!! Looove kimchi and I'm already looking forward to do those wraps!!! Thank you for sharing and have a great day! Wow this looks like something that could be my new favorite dish. It´s sounds amazing. 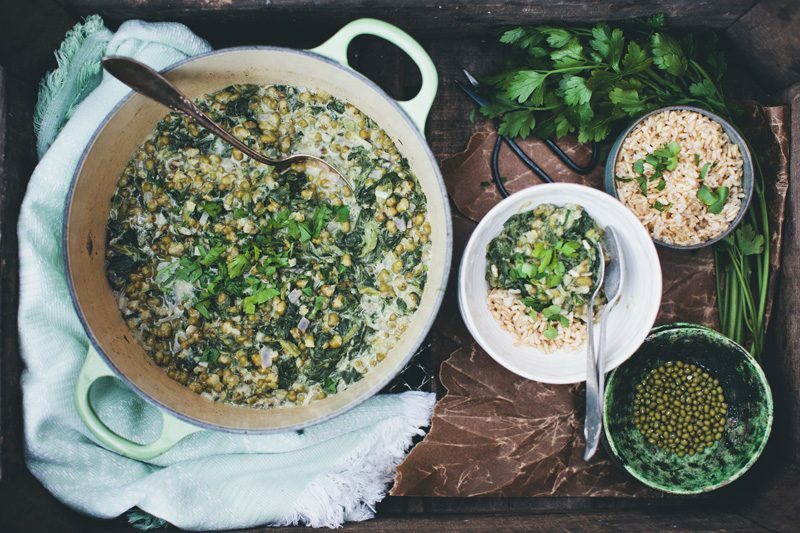 I will definitely add this to my to-do-food-list :) Thank you for a brilliant blog! I tried Korean BBQ last weekend for the first time and I fell in love with it! It's such a fun way to eat, and easy to prepare. Thank you for all recipes, I'll use them next time. Korean kitchen is totally new to me. I'm so excited to try some new things especially the kimchi which everyone is always raving about! Wow this looks amazing. Great photography. 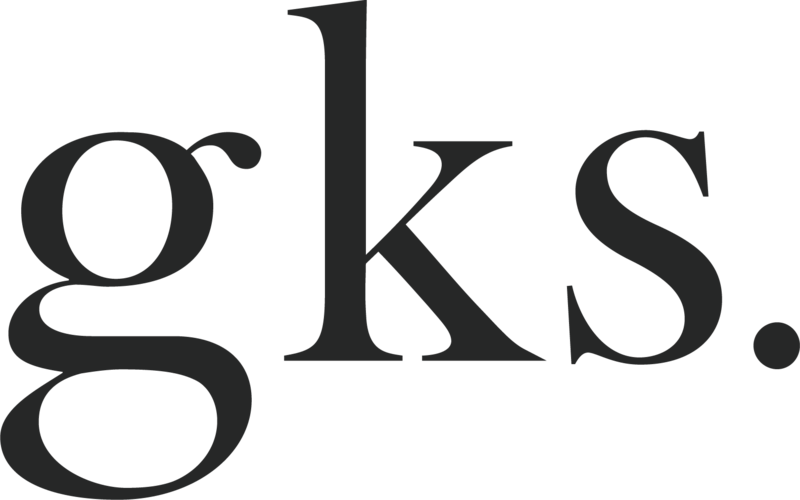 Please check out the food blog I have just started www.surreyKitchen.wirdpress.com. Thanks! I love the idea of Fermentation Week! I've been wanting to experiment with making fermented foods at home and this is exactly the kick that I need to get myself going. And the same goes for kimchi. A good fridge should always have some kimchi on hand. That Christmas dinner sounds magically tasty! Sometimes it is best to break away from old traditions and to make new ones instead. Awesome! I love kimchi but haven't gotten around to making my own yet. it looks so tasty!! but I'm not sure if i can get the napa salad in my country :) will have to look! Best! This really reminds me of bibimbap! I made your bibimbap (adding the traditional bulgogi as well) and loved it, so this is probably right up my alley. Do you think it would be good with some kind of marinated beet or as remixed bibimbap? These look so delicious, and the pictures are so beautiful! In your lead picture, I actually thought the lettuce leaves on the board were a painting -- until I saw the chopsticks! Fabulous Fermentation Week- how fun! I am definitely going to give this a try! Gorgeous photos! 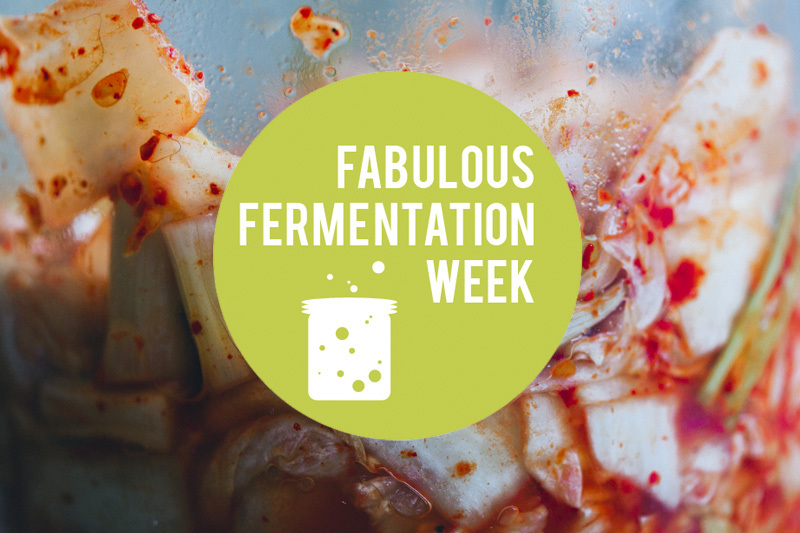 As a dietitian I'm loving the 'fabulous fermentation week'. Great for the gut...and pretty freaking delicious too.